Sunset at De Panne, Belgium . Florian Schaaf (site) took this sequence on 31st March '03. This 'Etruscan Vase' or 'Omega' sunset ends with a 1-2s long green flash. 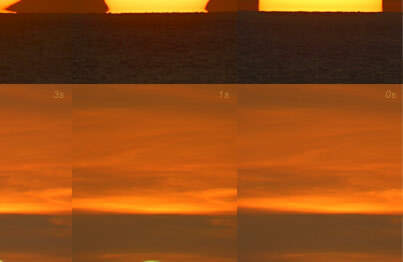 The sunset was mainly an inferior mirage event but, as usual, nature is richer - the sun is unusually distorted and look at the two other green flashes 42 and 11s before the sun disappeared! Larger images do better justice to this fine sequence, check #1, 2, 3 All images ©2003 Florian Schaaf, shown with permission. The classical green flash, a brilliant glint of green almost on the ocean horizon just as the sun disappears, relies on a mirage to magnify the usually small differences in refraction between red and green light. The mirage occurs when there is warm air immediately over the ocean and the air temperature gradient changes rapidly with height, i.e. the temperature profile is curved. For the flash to be visible the warm air layers must be below you. First indications of something unusual are when a sliver of a 'second sun' rises from the horizon as the 'real sun' descends. The lower sun is an inferior mirage (inferior because the image is below the real sun). As the sunset proceeds the lower sun eventually links with the upper sun to form an Etruscan vase or omega shape. The two suns overlap more and more. At the moment when the suns are almost gone the vertical magnification between the different paths of green and red rays is strongest. The green flash then shines forth. The mirage and green flash are sensitive to your height above sea level. The strongest Etruscan vase effects are seen close to the sea surface but you must be above the warm air layer to see the flash, too high and little will be seen. The above sequence was from dunes 10m high but somewhere a little lower could be optimum. The peculiar tall and spiky 'waves' are not real. They are the fluttery edge of the mirage and a sign that the sunset could be distorted with a green flash at its end.